These crispy pork cutlets are easy to make and delicious served with a classic white gravy. The recipe calls for the Japanese type of breadcrumb called Panko, which has a nice light texture while adding a satisfying crunch. The pork is made following the standard breading procedure where you first dredge in flour, then egg, and finally breadcrumbs, creating a coating that will adhere during cooking. The simple white gravy is essentially a variation on the classic béchamel sauce, made of a roux with simple seasonings. Drizzle on the crunchy cutlets and serve with roasted vegetables for a complete meal the whole family will love. Note: while there are multiple steps to this recipe, this pork cutlet dish is broken down into workable categories to help you better plan for preparation and cooking. With a meat mallet or some other heavy object, flatten the pork cutlets until they are about 1/4-inch thick. In a shallow dish, combine the 1 cup flour, paprika, and salt. In a second dish place the beaten egg, and put the Panko in a third dish. Line up the three separate shallow pans next to each other. Have a foil-lined baking sheet or baking dish ready. For each pork cutlet, begin by dredging it in flour. Then dip it in the egg. Then place on the baking sheet and chill in the fridge for 15 minutes. Heat about 1/4-inch of oil in a heavy bottomed sauté pan. Toss a few crumbs of Panko into the oil—when they sizzle the oil is ready. 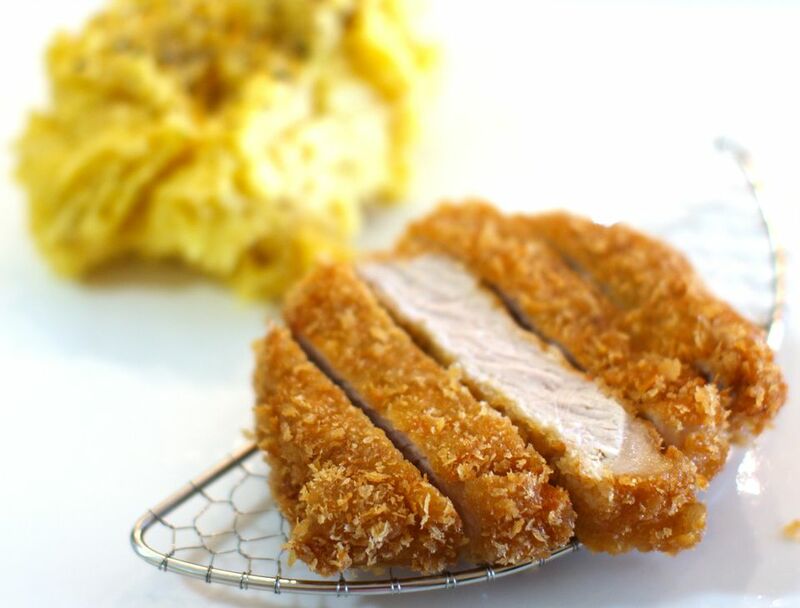 Fry the pork cutlets for 1 to 2 minutes, until golden brown on the bottom, and then flip and repeat. If your pan is small, work in batches rather than overcrowd the pan. Remove the pork cutlets to paper towels or a rack set over a baking sheet to drain excess oil. Keep warm while you make the white gravy. Drain all but about 1 tablespoon of oil from the pan. Stir in the 1 tablespoon flour until it forms a paste. Heat for 1 to 2 minutes over low heat, stirring frequently. Meanwhile, warm the milk in a saucepan or in the microwave until it is hot, but don't let it boil. Gradually whisk the hot milk it into the flour mixture, and increase the heat to medium. Heat the gravy until it thickens, about 5 minutes. If the gravy seems too thick you can add a little milk if necessary. Season to taste with Kosher salt and a generous amount of freshly ground black pepper. Sauce the pork cutlets with the white gravy and serve immediately.